From time to time I make egg rolls. I found a recipe in the June 2010 issue of Cooking light (Pan Fried Egg Rolls) that sounded so tasty and easy that I just had to try it. 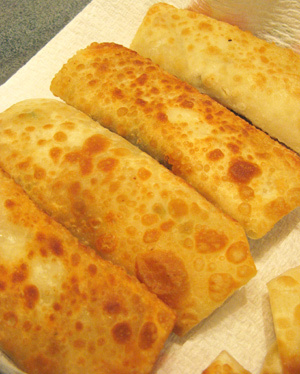 It was by far the best egg rolls I had ever made, but I found that the filling inside was not enough to make a dozen egg rolls as the recipe suggested. So I have added some ingredients and tweaked it a bit and I think it now works out to a full dozen. 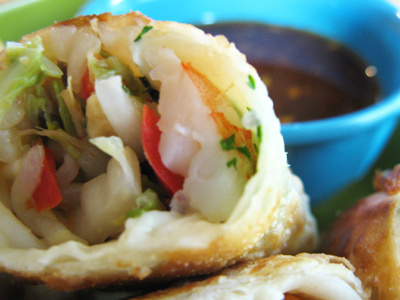 This is my version of Shrimp Egg Rolls. 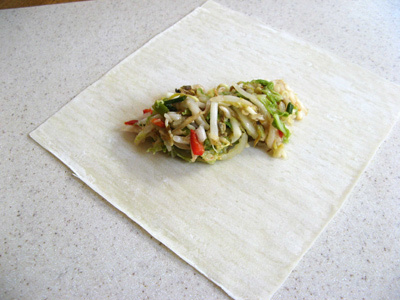 The egg roll filling includes shredded napa cabbage, bean sprouts, green onions, fresno red peppers, and fresh ginger. 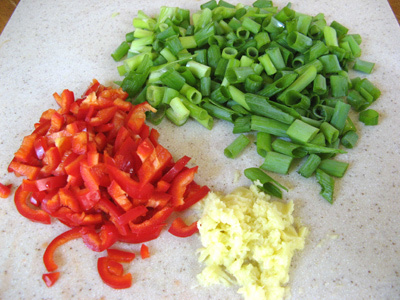 Chop the green onion tops and fresno peppers. I took a 1 inch piece of fresh ginger and grated on a coarse microplane grater. 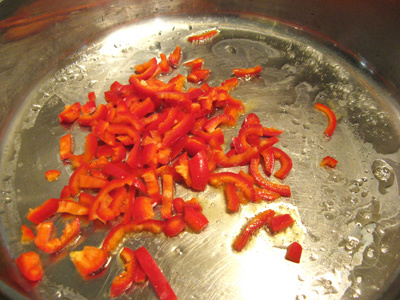 In a stainless steel pan saute the fresno red pepper for a few minutes over medium heat. Next add the green onion and ginger to the mix. Let that sweat out for just a minute or so. By this time the aroma of the ginger will start to kick in. 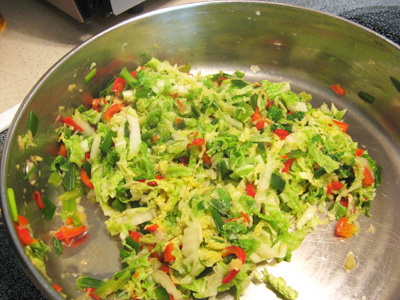 Add the napa cabbage and stir the pan. When it begins to wilt. 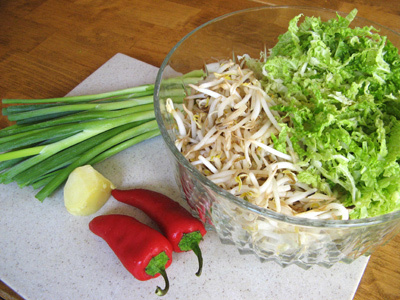 it’s time to add the bean sprouts. 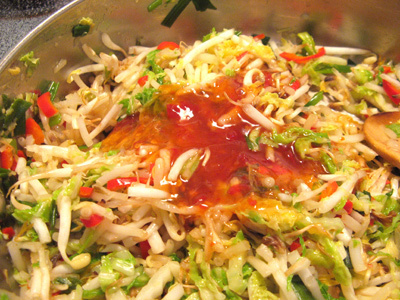 Once you’ve added the bean sprouts, move your pan off the heat element. Add in the sweet chili sauce. Now we’ve got the egg roll filling. Time to assemble. Almost forgot, we’re going to put some shrimp and cilantro on each egg roll. Spoon 2 heaping tablespoons of mix onto the egg roll wrapper. 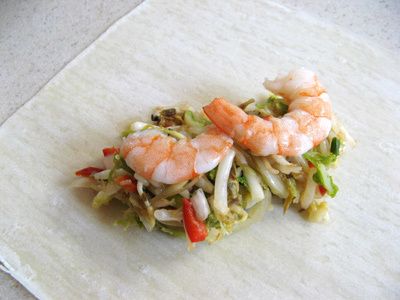 Cut 1 cooked, peeled and deveined shrimp lengthwise and place on top of mix. Sprinkle a little cilantro on top. Start to roll about halfway up. Fold in edges. 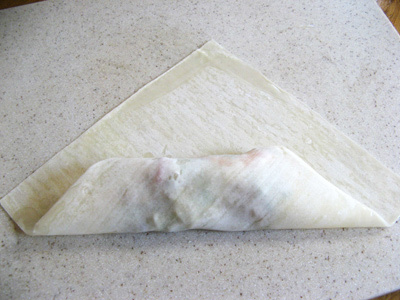 Dip finger in water and make a line across the top angles like sealing an envelope. Now finish rolling. The water around the edges will act like glue and seal it up. Pour just enough peanut oil in a non stick pan to coat the bottom. Heat on medium-high. To tell if the oil is hot enough, dip the handle of a wooden spoon in the oil and when it starts to bubble it’s ready. Place the egg rolls in the pan 4 at a time and fry a couple minutes on each side until all sides are brown and crispy. Place them on a paper towel to cool. Meanwhile we’ll make some dipping sauce. 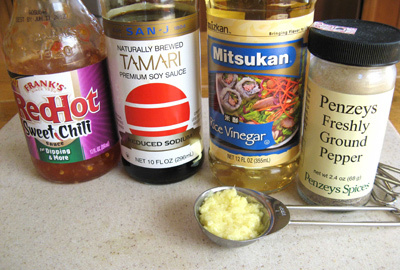 This simple and tasty sauce includes sweet chili sauce, tamari soy sauce, rice vinegar, fresh grated ginger and ground black pepper. Gently whisk all sauce ingredients together. In a stainless steel pan, drizzle peanut oil and add red pepper. 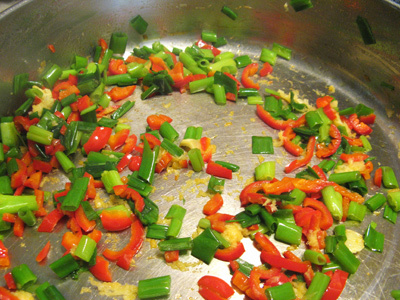 Saute for a minute or two, just until they begin to soften, add green onion and ginger. Stir fry for another minute or so until the onion soften and ginger becomes fragrant. 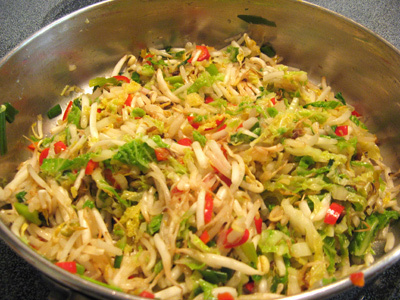 Add napa cabbage and stir fry just until it becomes wilted, then add bean sprouts. Stir and remove from heat element. Mix in 1/2 cup sweet chili sauce and set aside. 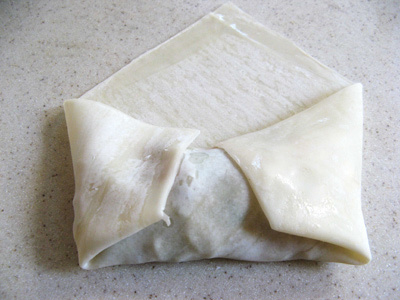 Roll egg rolls out by placing an egg roll wrapper on a flat surface. Add 2 heaping tablespoons of mixture onto wrapper. 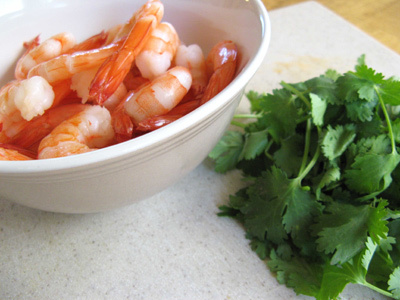 Place 1 shrimp cut lengthwise onto the mix and then sprinkle cilantro on top. 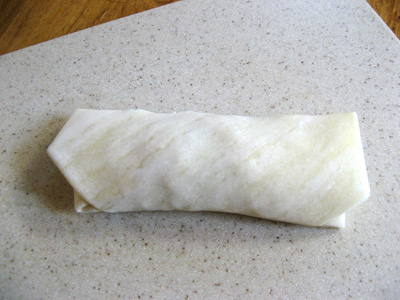 Roll egg roll around mixture halfway, fold edges to center so it looks like an envelope. Dip finger in water and line the edges of angle to seal. 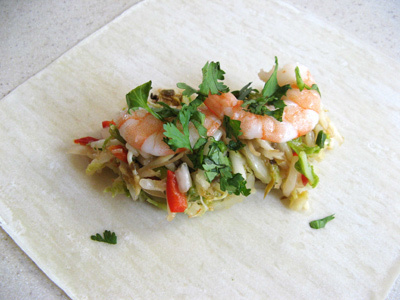 Wrap egg roll and seal. Pour enough peanut oil in a non-stick pan to cover bottom. 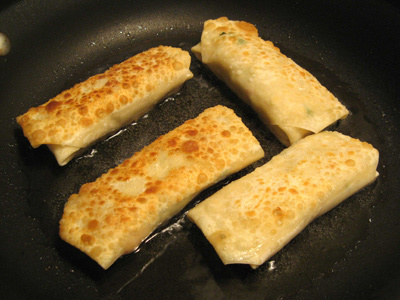 Place 4 egg rolls in at a time and pan fry a minute or so on each side until all sides are brown and crispy. Place on paper towel to cool. 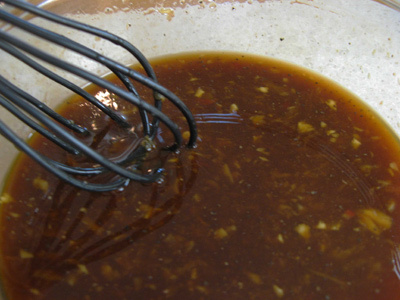 Combine all dipping sauce ingredients into a glass bowl and whisk gently until all ingredients are combined. 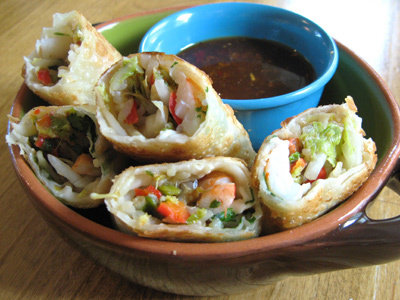 Dip egg rolls in sauce and eat.